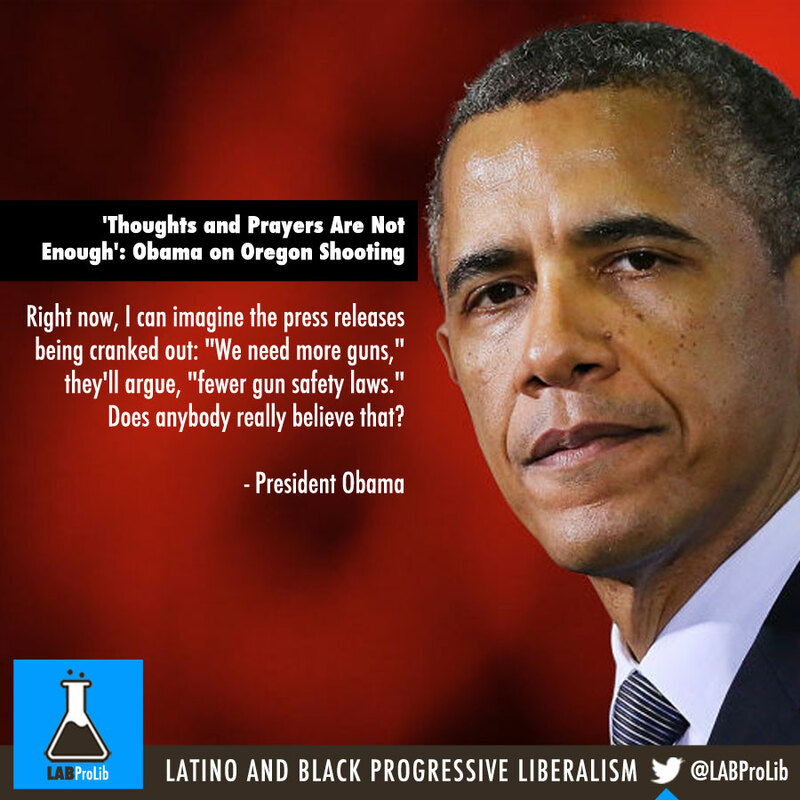 There’s been another mass shooting in America, this time in a community college in Oregon. That means there are more American families, moms, dads, children, whose lives have been changed forever. That means another community stunned with grief and communities across the country forced to relive their own anguish and parents across the country who are scared because they know it might have been their families or their children. I’ve been to Roseburg, Oregon. They’re really good people there. I want to thank all the first responders whose bravery likely saved lives today. Federal law enforcement has been on the scene in a supporting role, and we’ve offered to stay and help as much as Roseburg needs for as long as they need. In the coming days, we’ll learn about the victims — young men and women who were studying and learning and working hard with their lives set on the future, their dreams on what they can make of their lives. And Americans will wrap everyone grieving with prayer and our love. But, as I said just a few months ago and I said a few months before and I said each time we see one of these mass shootings, our thoughts and prayers are not enough. It’s not enough. It does not capture the heartache and grief and anger that we should feel, and it does nothing to prevent this carnage from being inflicted some place else in America next week or a couple months from now. We don’t yet know why this individual did what he did, and it’s fair to say that anybody who does this has a sickness in their minds regardless of what they think their motivations may be. But we are not the only country on Earth that has people with mental illnesses or want to do harm to other people. We are the only advanced country on Earth that sees these kind of mass shootings every few months. You know, earlier this year, I answered a question in an interview by saying the United States of America is the one advanced nation on Earth in which we do not have sufficient common-sense gun-safety laws even in the face of repeated mass killings. And later that day, there was a mass shooting in a movie theater in Lafayette, Louisiana. That day! Somehow, this has become routine. The reporting is routine. My response here at this podium ends up being routine. The conversation in the aftermath of it — we’ve become numb to this. And what’s become routine, of course, is the response to those who oppose any kind of common-sense gun legislation. Right now, I can imagine the press releases being cranked out: “We need more guns,” they’ll argue, “fewer gun safety laws.” Does anybody really believe that? There are scores of responsible gun owners in this country — they know that’s not true. We know because of polling that says the majority of Americans know we should be changing these laws, including the majority of responsible, law-abiding gun owners. There is a gun for roughly every man, woman and child in America. So how can you, with a straight face, make the argument that more guns will make us safer? We know that states with the most gun laws tend to have the fewest gun deaths. So the notion gun laws don’t work or just will make it harder for law-abiding citizens and criminals will still get their guns, it’s not borne out by the evidence. We know that other countries in response to one mass shooting have been able to craft laws that almost eliminate mass shootings. Friends of ours, allies of ours — Great Britain, Australia — countries like ours. So, we know there are ways to prevent it. This is something we should politicize. It is relevant to our common life together, to the body politic. I would ask news organizations — because I won’t put these facts forward — have news organizations tally up the number of Americans who have been killed in terrorist attacks in last decade and the number of Americans who’ve been killed by gun violence. And post those side by side on your news reports. This wont be information coming from me. It will be coming from you. We spend over $1 trillion and pass countless laws and devote entire agencies to preventing terrorist attacks on our soil, and rightfully so. And yet we have a Congress that explicitly blocks us from collecting data on how we could potentially reduce gun deaths. How can that be? This is a political choice that we make — to allow this to happen every few months in America. We collectively are answerable to those families who lose their loved ones because of our inaction. When Americans are killed in mine disasters, we work to make mines safer. When Americans are killed in floods and hurricanes, we make communities safer. When roads are unsafe, we fix them, to reduce auto fatalities. We have seat-belt laws because we know it saves lives. The notion that gun violence is somehow different — that our freedom and our Constitution prohibits any modest regulation of how we use a deadly weapon when there are law-abiding gun owners all across the country who could hunt and do everything they do under such regulations — it doesn’t make sense. So, tonight — as those of us who are lucky enough to hug our kids a little closer are thinking about the families who aren’t so fortunate — I’d ask the American people to think about how they can get our government to change these laws and to save lives and to let young people grow up. And that will require a change of politics on this issue, and it will require that the American people, individually, whether you are a Democrat or a Republican or an independent, when you decide to vote for somebody, are making a determination as to whether this cause of continuing death for innocent people should be a relevant factor in your decision. If you think this is a problem, you then should expect your elected officials to reflect your views. And I would particularly ask America’s gun owners who are using those guns properly, safely — to hunt, to sport, for protecting their families — to think about whether your views are properly being represented by the organization that suggests it’s speaking for you. And each time this happens, I’m going to bring this up. Each time this happens, I am going to say that we can actually do something about it, but we’re going to have to change our laws. And this is not something I can do by myself. I’ve got to have a Congress and I’ve got to have state legislators and governors who are willing to work with me on this. I hope and pray that I don’t have to come out again, during my tenure as president, to offer my condolences to families in these circumstances. But based on my experience as president, I can’t guarantee that, and that’s terrible to say. May God bless the memories of those who were killed today. May he bring comfort to their families and courage to the injured as they fight their way back. And may he give us the strength to come together and find the courage to change.